ASCOM is a nice platform providing unified access to astronomical hardware controllable from a computer. Hardware makers provide ASCOM driver and end user apps like PHD or Nebulosity may start using it without problems or additional drivers. For developers - those that want to make drivers or use the ASCOM API - the journey to ASCOM starts at digging through raw documentation. Some help may be found also on the mailing list. It's not documented as well as Django, but still - it's usable. We start with installing additional components that give documentation and few handy libraries. ASCOM platform uses .NET framework and provides .NET API. For other languages there is full API access via COM. The documentation is in Program Files/ASCOM/Platform 6 Developer Components/Developer Documentation (or "Program Files (x86)" on 64-bit Windows). The most interesting is PlatformDeveloperHelp.chm containing few examples and all the namespace of the ASCOM API. End user apps are those who use the ASCOM drivers/API to control the hardware like a mount or a camera. In most such cases we will use ASCOM.DriverAccess to do that. It gives a API to control domes, filter wheels, focuser, rotators or mounts. In PlatformDeveloperHelp.chm you will find the whole namespace for this library. print "	->Telescope was already connected"
print "	Connected to telescope now"
print "	Unable to connect to telescope, expect exception"
tel.SlewToCoordinates(12.34, 86.7)     # !! !pick coords currently in sky! win32com.client.Dispatch is used to load the library - a driver "id" in this case. "Celestron.Telescope" is the ID of the Celestron ASCOM driver that controls Celestron and SkyWatcher mounts. 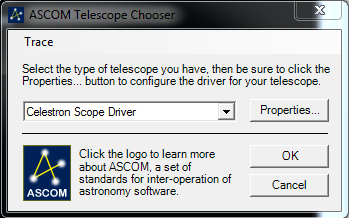 This driver has the same API as ASCOM.DriverAccess.Telescope. At start we connect to the device setting "Connected" to True. Then we set Tracking to True to order the mount to start tracking (sidereal rate by default). "SlewToCoordinates" method will slew the mount to given coordinates (RightAscension, Declination). To use the equipment the user wants we need to give him the ability to choose it. 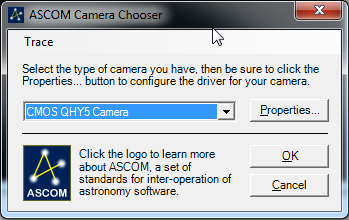 We need the driver ID like "Celestron.Telescope" and we will get it via ASCOM.Utilities.Chooser - this class shows the choose window for every type of equipment. Chooser supports all type of equipment handled by ASCOM. Choose method will show the choose window and will return the driver ID when user closes it. All settings applied by the user will be saved too. virtualenvwrapper is a virtualenv wrapper that makes it easier to navigate and manage multiple envs. When you are working on different projects they all need their own virtualnenvs as they require different versions of the same dependencies if not more. To work with multiple envs the virtualenvwrapper comes in handy. sh is a wrapper around Python subprocess library. It offers a nice and easy to use API - it allows using programs or system commands like if they were a function. Ximea machine vision cameras are handled via XiAPI. The API is implemented for the .NET platform. In this article I'll present a IronPython scripts that will use the .NET API to control the Ximea xiQ camera. IronPython is a Python implementation on the .NET platform and as such it can use any .NET libraries and resources. geopy is handy module for address geocoding - turning a location address into geographic coordinates (useful for maps). It supports various geocoding engines like Google Maps, Yahoo!, Windows Local Live and others. This module can be used to aid your GeoDjango code.